The first thing Nvidia showed off to the world this year was their re-brand of the GeForce Grid, which is now Nvidia Grid. For those of you who haven't heard of this 'The Grid' is a rack-based server that has support for up to 24 individual racks at a single time which offers a total 240 GPUs and 200 teraflops of computing prowess! Something which Nvidia compares to 700 Xbox 360s! Nvidia showed off upcoming cloud gaming clients for Android tablets and the Xbox 360 that will utilise the Grid and they look to have some potential! One fantastic feature is the ability to find your previous work on the game even if you stop playing on one device and pick up another, something which we can see being useful for those cloud connected commutes! If you're wondering what sort of games will be coming to this then at the moment Nvidia is working with Agawi, Cloudunion, Cybercloud, G-cluster, Playcast, and Ubitus and we'll let you know if and when we hear more about this because Nvidia hasn't made it clear when this will be available to the consumers, but we'll let you know when we hear more! You can find the full press release here! 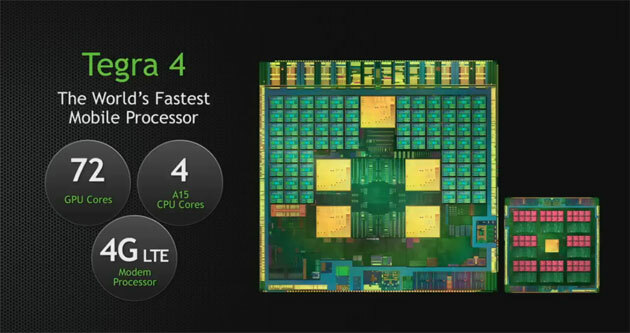 The Nvidia Tegra 4 Processor! The last few years Nvidia's line of Tegra processors has set the standard for mobile processors which everyone else races to keep up with. This year is no exception as the Tegra 4 really is a powerhouse! Just like it's predecessor, the Tegra 3, the Tegra 4 is set up with the '4-plus-1' system, so less intensive tasks can be handled by the lower power single core and when heavy lifting is required the other cores take over and do the work. But, there's also a fair few enhancements here too. Firstly the Tegra 4 uses the newer A15 architecture, which led Nvidia's CEO, Jen-Hsun Huang, to says that Tegra 4 is the world's fastest mobile processor, surpassing everything currently on the market. Nvidia hasn't revealed the clock speed options of the Tegra 4's yet, has there is a whopping 72 GPU cores, so everything should be buttery smooth! There's no official word at the moment on what sort of manufacturing process is used when making the Tegra 4, but rumours suggest Nvidia has opted for the 28nm manufacturing process, which again should aid power consumption! One nifty feature is the processors ability to take high dynamic range (HDR) photos instantaneously, which will undoubtedly build on Android's instant photo feature, but it'll take the quality to a new level! This processor does support LTE, but it is not integrated LTE, which will negatively impact battery life. Qualcomm doesn't currently offer an integrated LTE option, but they're widely expected to have one ready by the end of Q2 this year! The full press release is available here! And finally, the Nvidia Project Shield! Every year companies announce something we haven't had any word of and things we genuinely didn't expect. This was the 'and finally' moment in Nvidia's keynote and it's also their wow announcement. 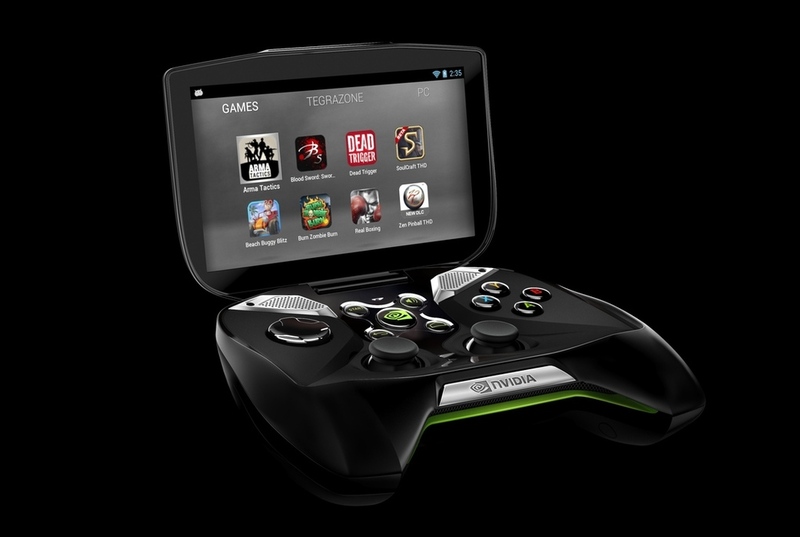 Pictured above is Nvidia's Project Shield; an Android powered games handheld which is powered by the Tegra 4 processor and has the ability to play console-quality games on an essentially mobile device. The key features of this device include the ability to push 4K video through HDMI to external displays, yes that's 4K! There's also 'advanced sound processing' which Nvidia claims will trump Beats Audio-equipped laptops, and there's a solid 33Wh battery which will provide five to ten hours of gaming time or around about 24 hours of HD video playback. The device itself will include a 5-inch, 720p 'Retinal' multitouch display which offers a PPI of 294 and there's also a micro-SD card slot for storing all that in-game content. Naturally the device is powered by Android and it's vanilla Android too, there is absolutely no skinning and there's Play Store compatibility and all of Google's Apps are available for the device too! But, the gaming options don't end there; instead the Shield also gives you the option to stream games from a home Windows PC which will have to be rocking a GeForce GTX 650 (or higher) graphics card. From there you can access your library of PC games over Wifi, you'll also be able to use your Steam library! The way this works is the Shield runs the games virtually, so your PC does the heavy lifting. In the future, Nvidia wants to give you the option to stream content from the Shield to a television wirelessly. This will let you watch video and play games on your TV display without the need for a tonne of wires! At the moment there's no word on pricing but it will be coming to the US and Canada at some point in Q2! There's a cool little video which shows off the clamshell design really nicely embedded below!